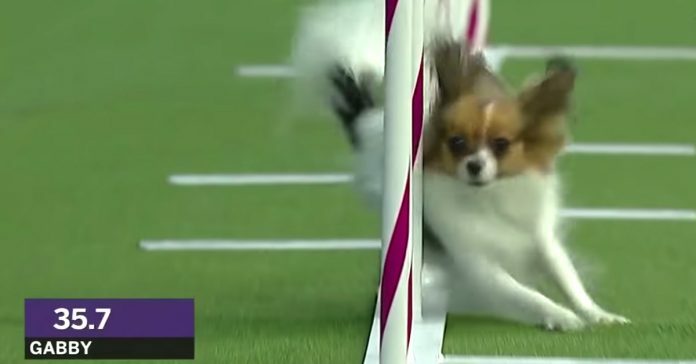 Gabby is a Papillon, and she blew her competition away at the Westminster 2019 Masters Agility Championship. She was placed in the smallest division (8″ class), and she set the speed record for the agility competition. She really blew away the crowd with her performance. Winky, a Bicho Frise, previously held Gabby’s record, but that didn’t stop Gabby from pushing the limits of all dogs of her size. At the end, of course, Gabby finished with a time 39.31 seconds, and her handler Andrea Samuels was just as excited as Gabby. The crowd watched in awe as the little pup sped through the course, and Andrea deserves a lot of credit, as well, for the incredible job that she did training Gabby. Gabby’s entire performance can be witnessed, and you will find yourself in awe, like those that attended the event.